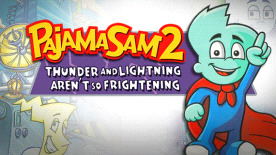 Join Pajama Sam, the world's youngest superhero! ...as he journeys to World Wide Weather, the storm-stirring factory in the sky! Sam's spent on to many evenings cowering under the couch, so he sets out to conquest his fear of thunderstorms. Just as our little guy begins to learn that storms aren't as bad as they seem, Sam accidentally send the weather system into a frenzy. Now, there is snow in Saigon, and sunshine in Seattle! He'll need your child's help to explore this wonderful world filled with challenging puzzles, fun games, and fantastic new friends as they help Thunder and Lightning fix the broken machines and return the world's weather to normal before Mother Nature finds out! Play again and again, New puzzles, new friends and new challenges await each time you play! Click points reveal hundreds and hundreds of hidden surprises! Special games and activities encourage creativity, help teach spatial-relations and sharpen problem-solving skills. Out of time? Save the game and finish it later. Pajama Sam 2: Thunder and Lightning Aren't so Frightening ©2014 Tommo Inc. All rights reserved. Humongous Entertainment and the Humongous Entertainment logo are trademarks or registered trademarks of Tommo Inc.